The HSE is warning parents and the general public to be vigilant following three meningitis deaths in Ireland in recent weeks. Parents are advised to check their children have been vaccinated against the illness, as it poses a serious risk to children and adolescents. Eleven cases have been notified to the Health Protection Surveillance Centre (HPSC) since the last week in December 2018. Three of the patients diagnosed with meningococcal disease died directly due to the infection. The 11 cases notified in the last week of 2018 and the first week of 2019 compares to five cases for the same time period last year. Here’s a reminder of what exactly is meningitis. 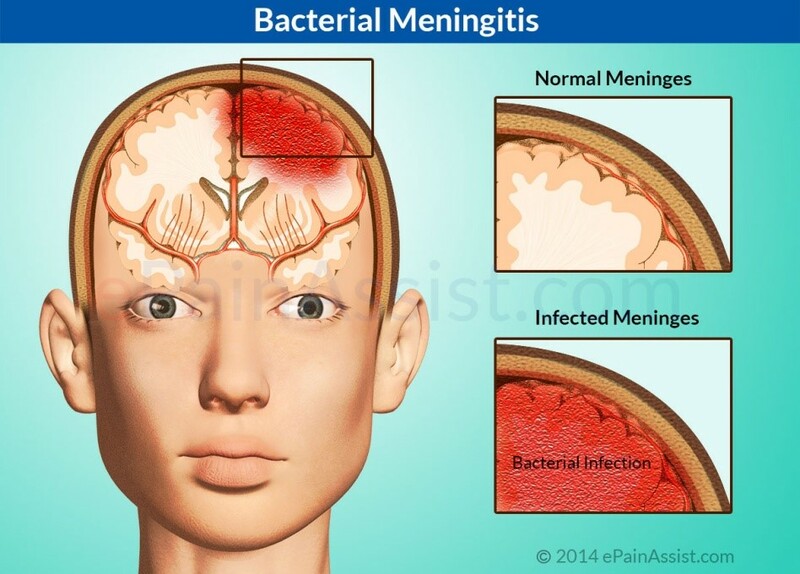 Meningitis is an infection which causes acute inflammation of the protective coverings of the spinal cord and brain. The tissues in the brain become inflamed in response to try and prevent the infection spreading. Inflammation is a process that can include swelling and when these sensitive tissues in the brain are inflamed and swell it can cause brain and nerve damage. Meningitis often occurs along with septicaemia. Bacterial causes are usually more serious than other forms. Bacterial meningitis has more noticeable characteristics and requires more urgent care. Therefore if bacterial meningitis is suspected it is critical that the patient is treated with the most appropriate antibiotics immediately. Untreated bacterial meningitis can be fatal. Viral meningitis is almost never life-threatening and viruses rarely cause septicaemia. Viral meningitis can be mild and may not obviously be meningitis with symptoms similar to the flu. Fungal meningitis is very rare in Ireland but is serious. It usually only affects people with weakened immune systems. The rash that occurs with meningitis is due to septicaemia. One sign of septicaemia is a rash that does not fade under pressure. It may fade at first so it is advisable to continue checking. While most people associate bacterial meningitis with this rash it does not always appear so if in doubt always contact a health care professional. 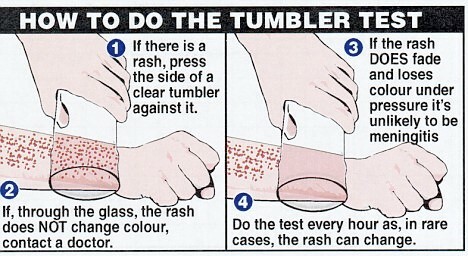 While if the rash does not disappear after being pressed down with the glass you should seek medical help as this may be a sign of meningitis. How do you get meningitis? It is most common in children under five but especially babies under 1 year old. It can also be common in teenagers. The majority of people are immune to it over the age of 25. It is normally passed on by someone who is infected via sneezing, kissing, sharing utensils or a toothbrush, for example. The bacteria that cause meningitis cannot live for long outside of the body. You need to be in prolonged close contact with an infected person to get the infection. In the case of a meningitis outbreak this is usually when people are living together in a close environment such as boarding school or college. 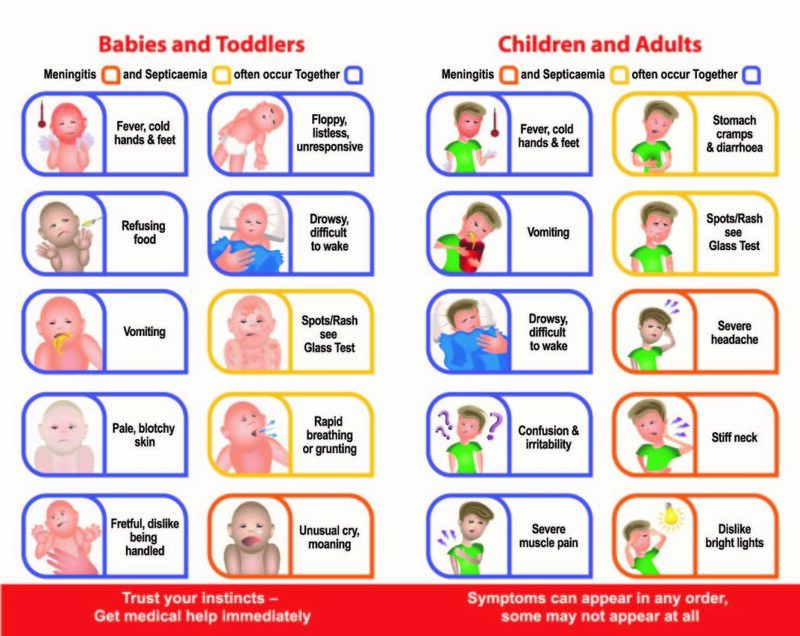 The majority of the symptoms of meningitis are those that children would commonly experience such as fever, vomiting and being off their food however there are a range of signs that may suggest your child has meningitis. If you suspect your child has meningitis bring them to your local hospital. Someone with bacterial meningitis will require urgent treatment in hospital. If they have severe meningitis, they may need to be treated in an intensive care unit. Antibiotics are used to treat the infection while other medicines such as steroids may be used to treat the inflammation. The severity of the infection will determine the duration of the hospital stay and the treatments required. If someone who has been diagnosed with meningitis has been in close contact with other individuals sometimes it is necessary for those people to take precautionary antibiotics to prevent infection. Viral meningitis is usually treated at home. The person can take painkillers and have plenty of rest. They usually recover within a week. Meningitis spread can be prevented by using good hygiene practices and a good hand washing technique. In Ireland the childhood vaccination programme covers different strains and has been shown to have significantly reduced the occurrence of infection. 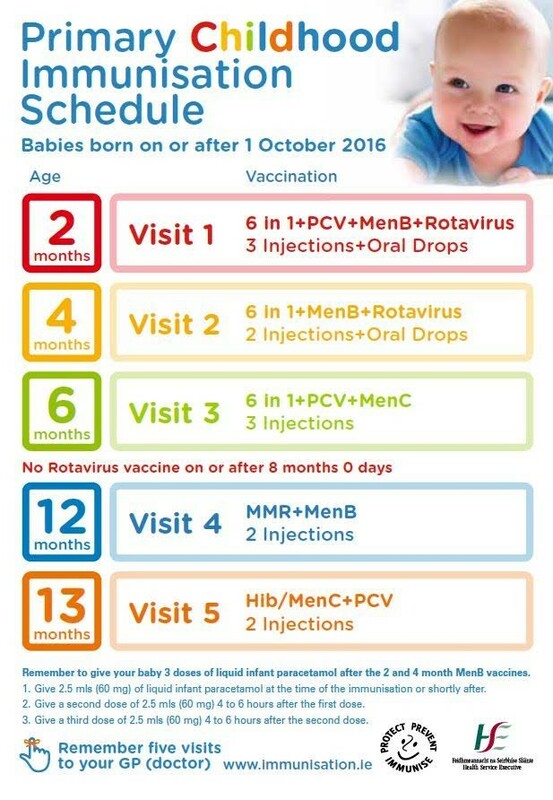 Children receive this vaccine as part of their immunisation schedule therefore it is important that these appointments are not missed. Meningitis B was included in the baby immunisation schedule from October 2016. All babies born before this were not vaccinated against meningitis B. There is an option to purchase these vaccines for those children not vaccinated. Please speak to your GP or Pharmacist about this if you have concerns. Going to press, the Meningitis B vaccine is in short supply with most GP surgeries. 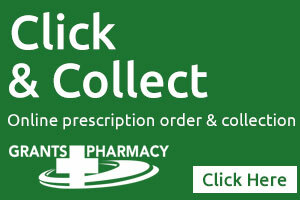 The advice is to keep in touch with you GP and they will keep you updated. Are you worried about CHOLESTEROL?